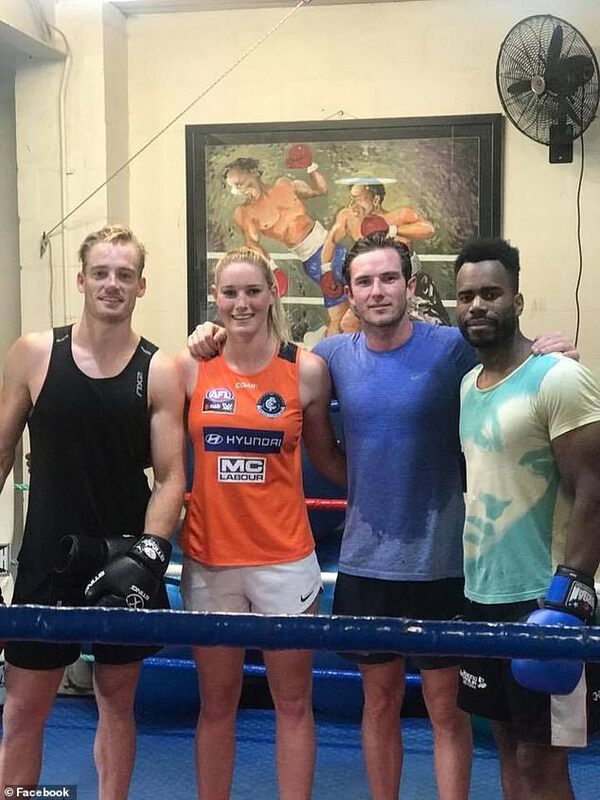 Tayla Harris' boxing coach of more than two years has given the 21-year-old AFL star a grim warning after she was subjected to perverted abuse online. A photo of the Carlton footballer kicking a ball during a match was posted to the 7AFL Facebook page on Tuesday but was taken down after it attracted vile sexual comments. 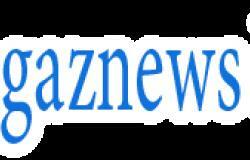 The young gun was forced to respond to the media storm and admitted she was concerned the Trolls who made the comments might target her. 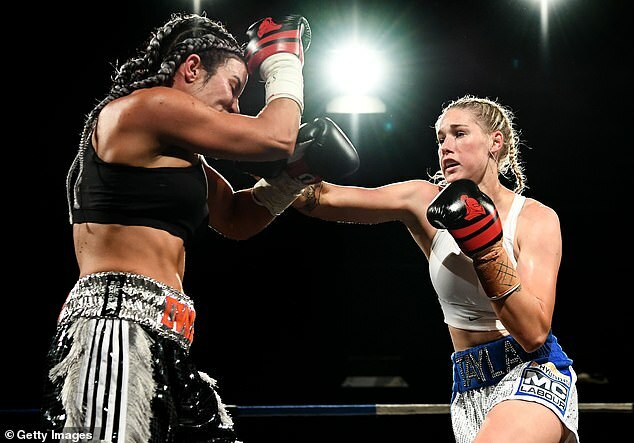 Harris is one of 20 women who attends Murphy's Boxing Gym in Surrey Hills, Melbourne, where she is trained by Gerry Murphy. Mr Murphy recalled the moment he first met the young athlete, describing her as 'very strong' and intelligent for her age. 'I used to be the boxing coach at Hawthorn footy club. I trained Buddy and Luke Hodge, all those people. I would call Tayla the female Buddy Franklin. She's a freak, an absolute freak as far as physical ability goes,' Mr Murphy told Wide World of Sports. Mr Murphy said she doesn't panic like other fighters and is 'courageous' when in the ring. 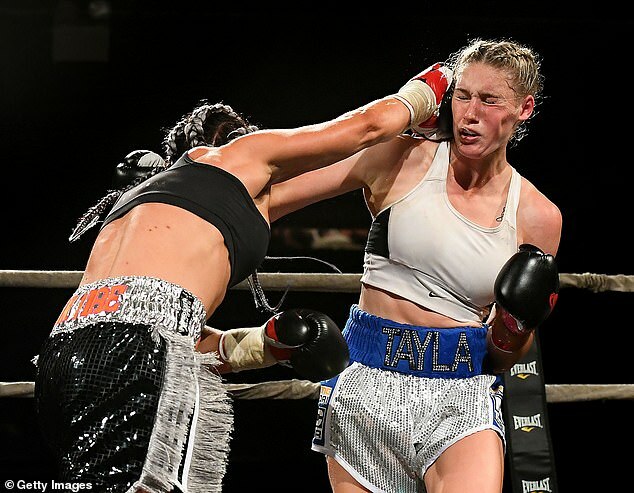 Harris is the unbeaten world No.7 pro middleweight and has been offered a world title fight but was unable to balance it with her AFL career. But despite being confident enough to take on men at the same weight and reign victorious, Mr Murphy warned Harris to remain vigilant following the week's social media blowout. 'I did speak to her (Wednesday) night and just said with these idiots sexualising her picture and whatever, that she just has to be very, very careful when she's on her own,' he said. Mr Murphy said he told her to avoid going out to the street on her own as the incident could bring out the 'nutters'.